Who Is a Good Candidate For a Chemical Peel? Chemical peels can improve the skin's appearance. In this treatment, a chemical solution is applied to the skin, which makes it "blister" and eventually peel off. The new skin is usually smoother and less wrinkled than the old skin. Areas of sun damage may improve after chemical peeling. After a chemical peel, skin is temporarily more sensitive to the sun, so wear sunscreen every day. It should say "broad-spectrum" on the label, meaning it protects against the sun's UVA and UVB rays. Also, it should be a physical sunscreen and be above SPF 30. Limit your time in the sun, especially between the hours of 10 a.m. and 2 p.m., and wear a wide-brimmed hat. Generally, fair-skinned and light-haired patients are better candidates for chemical peels. If you have darker skin, you may also have good results, depending upon the type of problem being treated. But you also may be more likely to have an uneven skin tone after the procedure. Skin sags, bulges, and more severe wrinkles do not respond well to chemical peels. They may need other kinds of cosmetic surgical procedures, such as laser resurfacing, a facelift, brow lift, eyelid lift, or soft tissue filler (collagen or fat). A dermatologic surgeon can help determine the most appropriate type of treatment for you. Tell your doctor if you have any history of scarring, cold sores that keep coming back, or facial X-rays. Before you get a chemical peel, your doctor may ask you to stop taking certain drugs and prepare your skin by using other medications, such as Retin-A, Renova, or glycolic acid. The doctor may also prescribe antibiotics or antiviral drugs. Work with your doctor to determine the depth of your peel. This decision depends upon the condition of your skin and your goals for treatment. Ask your doctor in advance whether you will need to have someone drive you home after your peel. You can get a chemical peel in a doctor's office or in a surgery center. It's an outpatient procedure, meaning there's no overnight stay. The professional who does your peel will first clean your skin thoroughly. Then he or she will apply one or more chemical solutions -- such as glycolic acid, trichloroacetic acid, salicylic acid, lactic acid, or carbolic acid (phenol) -- to small areas of your skin. That creates a controlled wound, letting new skin take its place. During a chemical peel, most people feel a burning sensation that lasts about five to ten minutes, followed by a stinging sensation. Putting cool compresses on the skin may ease that stinging. You may need pain medication during or after a deeper peel. Depending upon the type of chemical peel, a reaction similar to sunburn occurs following the procedure. Peeling usually involves redness followed by scaling that ends within three to seven days. Mild peels may be repeated at one to four-week intervals until you get the look you're after. Medium-depth and deep peeling may result in swelling as well as blisters that may break, crust, turn brown, and peel off over a period of seven to 14 days. Medium-depth peels may be repeated in six to 12 months, if necessary. After treatment, you may need bandages for several days on part or all of the skin that was treated. You'll need to avoid the sun for several months after a chemical peel since your new skin will be fragile. Some skin types are more likely to develop a temporary or permanent color change in the skin after a chemical peel. Taking birth control pills, subsequent pregnancy, or a family history of brownish discoloration on the face may make that more likely. There is a low risk of scarring in certain areas of the face. Some people may be more likely to scar. If scarring does happen, it can usually be treated with good results. For people with a history of herpes outbreaks, there is a small risk of reactivating cold sores. Your doctor can prescribe medication to prevent or treat that. American Society for Dermatological Surgery: "Chemical Peels Information." American Academy of Dermatology: "Chemical Peeling." 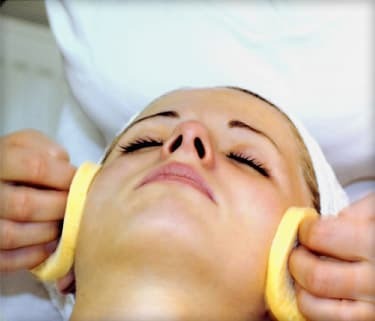 Quiz: What Do You Know About Chemical Peels?